Fireworks exploded in the sky above Phil Welch stadium as Mason Janvrin stood in the batters box with Malik Williams a mere 90 feet from home. Bomber’s pitcher Nathan Croner sailed a pitch that ricocheted off the rustic brick backstop. Williams sped home as the Mustangs cut the lead to one in the sixth inning. The run would not be enough as the Sedalia Bombers defeated the Mustangs 6-2 in the eighth annual Independence Day matchup between the two teams. Fans were able to bid on special-edition game-worn jerseys during the game. All the proceeds from the jersey auction supported an honor flight for local veterans. The Mustangs were proud to welcome our nations veterans to Phil Welch. All active duty and retired military personnel received two-free tickets to Wednesday’s game. Trailing by three runs with runners on the corners in the third, Terrence Spurlin hit a sacrifice fly to right field. Joshua Lincoln tagged up and scored. Mustang’s fans received a front row seat to a special Independence Day Mosaic Life Care Fireworks Spectacular. Jordan Maxson went 3-4 with three singles. Malik Williams went 1-3 with a walk and a run scored. The Mustang’s are 6-2 all time against the Bombers on Independence Day. St. Joe falls to 16-15. The Mustangs are five and a half games behind the first place Bombers. 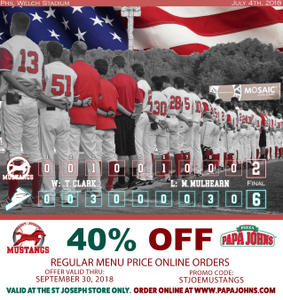 The Mustangs will hit the road to begin a three-game series with the Jefferson City Renegades (16-13). St. Joe will be back at Phil Welch 7 p.m. Saturday to take on the Renegades in the final game of the series. Be one of the first 250 fans to the ballpark and receive a Mustangs piggy bank curtsey of UMB bank. Come out and support your local law enforcement in the Pregame fire vs. police softball game from 5:30-6:30 p.m. All Fire/Police/EMT receive 2 free GA tickets with ID. Stay in your seats following the game to enjoy the Mosaic Life Care Fireworks Spectacular featuring the top songs from the year 2015.